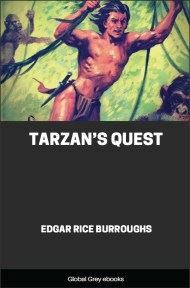 This is the twenty-second book in the Tarzan Series. The novel is set during World War II. The term "foreign legion" does not refer to the French Foreign Legion, but is the name given in the book to a small international force (including Tarzan) fighting the Japanese. While serving in the R.A.F. under his civilian name of John Clayton, Tarzan is shot down over the island of Sumatra in the Japanese-occupied Dutch East Indies. 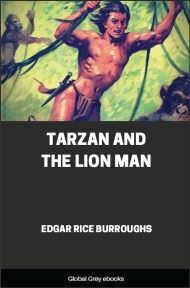 He uses his jungle survival skills to save his comrades in arms, and they fight the Japanese while seeking escape from enemy territory. PROBABLY not all Dutchmen are stubborn, notwithstanding the fact that stubbornness is accounted one of their national characteristics along with many virtues. But if some Dutchmen lacked stubbornness, the general average of that intangible was maintained in the person of Hendrik van der Meer. As practiced by him, stubbornness became a fine art. It also became his chief avocation. His vocation was that of rubber planter in Sumatra. In that, he was successful; but it was his stubbornness that his friends boasted of to strangers. So, even after the Philippines were invaded and Hong Kong and Singapore fell, he would not admit that the Japanese could take Netherland East India. And he would not evacuate his wife and daughter. He may be accused of stupidity, but in that he was not alone. There were millions in Great Britain and the United States who underestimated the strength and resources of Japan—some in high places. Furthermore, Hendrik van der Meer hated the Japanese, if one can hate what one looks upon contemptuously as vermin. "Wait," he said. "It will not be long before we chase them back up their trees." His prophecy erred solely in the matter of chronology. Which was his undoing. And the Japs came, and Hendrik van der Meer took to the hills. With him went his wife, who had been Elsje Verschoor, whom he had brought from Holland eighteen years before, and their daughter, Corrie. Two Chinese servants accompanied them—Lum Kam and Sing Tai. These were motivated by two very compelling urges. The first was fear of the Japanese, from whom they knew only too well what to expect. The other was their real affection for the van der Meer family. The Javanese plantation workers remained behind. They knew that the invaders would continue to work the plantation and that they would have jobs. Also, this Greater East Asia Co-Prosperity appealed to them. It would be nice to have the tables turned and be rich and have white men and women to wait on them. So the Japs came, and Hendrik van der Meer took to the hills. But not soon enough. The Japs were always right behind him. They were methodically tracking down all Netherlanders. The natives of the kampongs where the van der Meers stopped to rest kept them informed. By what natural or uncanny powers the natives knew while the Japs were still miles away is beside the question. They knew, as primitive people always know such things as quickly as more civilized peoples might learn them by telegraph or radio. They even knew how many soldiers composed the patrol—a sergeant, a corporal, and nine privates. "Very bad," said Sing Tai, who had fought against the Japs in China. "Maybe one time an officer is a little human, but enlisted men never. We must not let them catch," he nodded toward the two women. As they went higher into the hills, the going became bitter. It rained every day, and the trails were quagmires. Van der Meer was past his prime, but he was still strong and always stubborn. Even had his strength given out, his stubbornness would have carried him on. Corrie was sixteen then, a slender blonde girl. But she had health, strength, and endurance. She could always have kept up with the men in the party. But with Elsje van der Meer it was different. She had the will but not the strength. And there was no rest. They would scarcely reach a kampong and throw themselves down on the floor of a hut, wet, muddy, exhausted, before the natives would warn them away. Sometimes it was because the Jap patrol was gaining on them. But often it was because the natives feared to let the enemy find them harboring whites. Even the horses gave out at last, and they were compelled to walk. They were high in the mountains now. Kampongs were far apart. The natives were fearful and none too friendly. Only a few years ago they had been cannibals. For three weeks they stumbled on, searching for a friendly kampong where they might hide. By now it was obvious that Elsje van der Meer could go but little farther. For two days they had come upon no kampong. Their food was only what the forest and the jungle offered. And they were always wet and cold. Then late in the afternoon they came upon a wretched village. The natives were surly and unfriendly, but still they did not deny them such poor hospitality as they could offer. The chief listened to their story. Then he told them that while they could not remain in his village, he would have them guided to another far off the beaten track, where the Japs would never find them. Where, a few weeks before, he might have commanded, van der Meer now swallowed his pride and begged the chief to permit them at least to remain overnight that his wife might gain strength for the journey that lay ahead. But Hoesin refused. "Go now," he said, "and I will furnish guides. Remain, and I will make you prisoners and turn you over to the Japanese when they come." Like the headmen of other villages through which they had passed, he feared the wrath of the invaders should they discover that he was harboring whites. And so the nightmare journey was resumed through terrain cut by a frightful chasm, river eroded in tuff strata laid down through the ages by nearby volcanoes. And this river cut their trail, not once, but many times. Sometimes they could ford it. Again it could be crossed only on frail, swaying rope bridges. And this long after dark on a moonless night.